As we previously reported, on 11/22/2016, Judge Amos Mazzant (E.D. Texas) granted a preliminary injunction that halted the 12/1/2016 implementation of the DOL’s Final Overtime Rule, which would have more-than-doubled the minimum salary level for executive/administrative/professional exempt employees. On 12/1/2016, the U.S. DOL filed a notice of appeal to the Fifth Circuit Court of Appeals, indicating that it strongly believes that the DOL followed all required administrative processes, and there is no reason to delay implementation of the Final Rule. This fight is not over. Employers that have not yet undertaken serious analysis of the duties of claimed exempt positions should do so promptly and determine the strategies they will implement should the injunction be vacated. Stay tuned for further news and analysis of this hotly evolving issue. This entry was posted in DOL, News & Tips, Overtime Pay and tagged DOL, DOL Overtime Rule, employers, employment law, Exempt Employees on December 2, 2016 by smithamundsen. As we anticipated and previously discussed, on August 27, 2015, the National Labor Relations Board (NLRB) issued its ruling in the closely watched Browning-Ferris Industries of California, Inc. (BFI) case (Case 32-RC-109684). In rejecting over 30 years of precedent and the underlying Administrative Law Judge’s ruling on the issue, the NLRB’s pro-union majority established a new standard for determining joint-employer status. While the decision related to a company’s engagement of a subcontractor supplying workers, the NLRB’s new joint-employer standard will certainly have a direct impact on franchisor/franchisee relationships, temporary staffing and leased employee business models as well as all aspects of employment outsourcing. In short, it lays the groundwork to overturn other past NLRB decisions and will, if left unchecked, alter how two or more independent businesses conduct business in the United States. The underlying case: Teamsters Local 350 filed an organizing petition seeking to represent employees of Leadpoint who were placed at BFI’s facility. BFI and Leadpoint objected to this organizing attempt and ultimately prevailed before the NLRB’s assigned Administrative Law Judge. The ALJ, in applying decades of precedent, ruled that BFI and its subcontractor, Leadpoint, were not joint employers because BFI did not share “immediate and direct control” over the terms and conditions of Leadpoint’s employees working at the BFI facility. The Teamsters appealed the decision and urged the NLRB to adopt a new standard to allow the representative process to move forward. The NLRB’s General Counsel advanced the Teamsters’ position as well as a host of pro-union organizations — once invited to do so by the NLRB. The new standard: According to the NLRB’s majority, two or more entities should be deemed joint employers of a single workforce under the Act when (1) they are both employers within the meaning of the common law; and (2) they directly or indirectly share or codetermine essential terms and conditions of employment. In evaluating whether an employer possesses sufficient control over employees to qualify as a joint employer, the NLRB will now consider whether an employer has exercised or reserved ANY control over terms and conditions of employment (directly or indirectly). Suffice to say… it’s now a very low standard. According to the majority, the new standard is designed “to better effectuate the purposes of the Act [National Labor Relations Act] in the current economic landscape.” However, make no mistake… this means exactly what the union, pro-union organizations and the NLRB’s own General Counsel advanced — which was essentially: if business conditions make it more difficult for unions to organize workers or collectively bargain, then the standards must be lowered to allow such. The impact: Two separate and distinct legal entities could now be embroiled with one another’s alleged unfair labor practices, union organizing drives, strike activities and picketing disputes as well as mandatory bargaining obligations. Further, this decision lays the groundwork for the NLRB to overturn other key decisions and continue its recent actions to provide unions with life-support. For instance, in July 2015, the NLRB invited briefs in the Miller & Anderson, Inc. matter (05-RC-079249), to help determine if the NLRB should overturn its decision in Oakwood Care Center (343 NLRB 659), which disallowed inclusion of solely employed employees or jointly employed employees in the same unit absent consent of both employers. Have no doubt, the writing is already on the wall here. Additionally, this decision will certainly be used by the EEOC, U.S. DOL and other federal agencies in their ongoing efforts to increasingly regulate the workplace. Conclusion: Take action now! Don’t wait. First, immediately review and analyze all written agreements in place between your organization and any 3rd party. Whether you are a franchisor, franchisee, user company, general contractor, subcontractor, supplier company, temporary staffing firm…. It does not matter. Review all agreements through the lens of the NLRB and its bent towards finding joint-employer status. Second, carefully review and evaluate actual supervisory functions and oversight, training requirements and other day-to-day activities surrounding employee relations (of your own direct employees and 3rd party employees). Finally, perhaps its time to sit down and determine whether your current business model needs to be tweaked or modified in light of these disturbing developments. This entry was posted in National Labor Relations Board, News & Tips and tagged Joint Employers, NLRB, Temporary Staffing on August 28, 2015 by smithamundsen. On July 15, 2015, the U.S. Department of Labor (DOL) issued an Administrator’s Interpretation addressing the distinction between employees and independent contractors in the Fair Labor Standards Act (FLSA). The DOL has aggressively pursued potential misclassifications of employees as independent contractors in recent years. Indicative of that aggressive approach, the interpretation states that most workers are employees under the FLSA. While that statement is walked-back somewhat in other parts of the interpretation, businesses that rely heavily on independent contractors should take this message to heart and reassess whether their independent contractor relationships will truly survive scrutiny by the DOL and other government agencies. 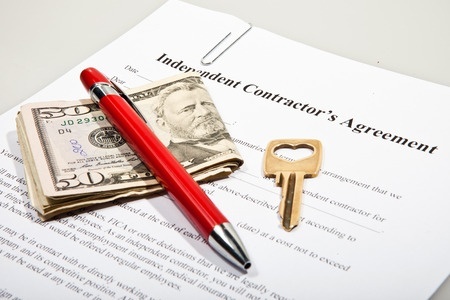 The consequences of independent contractor misclassification may be severe and include liability for unpaid taxes, wages, and other damages and costs. Much of the interpretation covers old ground, but nevertheless there are several interesting insights. Among them is the interpretation’s discussion on workers who are able to choose how many hours they work in a day or week, or when and where they perform their work. In short, the interpretation states that such freedom should not weigh heavily in favor of an independent contractor relationship if the workers are not exercising managerial skills in a way that affects the workers’ opportunities to realize profits or losses. However, if a worker negotiates the rate at which customers paid for the worker’s services, then that would indicate independent contractor status. In the end, the question of whether a worker is an employee or independent contractor will generally boil down to whether a worker is truly “in business for him or herself”—and therefore an independent contractor—or whether the worker is “economically dependent on the employer” and an employee. That said, if your business treats workers who are economically dependent on your business as independent contractors, we strongly recommend seeing advice of counsel to determine if changes can be made to ensure a strong defense against litigation or other enforcement actions by the DOL or the independent contractors themselves. This entry was posted in Employment, Employment Policies, News & Tips and tagged Fair Labor Standards Act, independent contractor, U.S. Department of Labor on July 20, 2015 by smithamundsen.